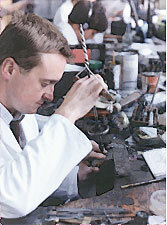 For well over 100 years, Alabaster & Wilson Ltd. has epitomised top quality and craftsmanship in the manufacture of fine jewellery in England. 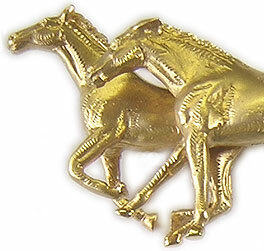 From a beautifully enamelled diamond racehorse brooch, to a fine black opal and diamond ring, pendants or cuff links in gold or platinum set with diamonds and precious coloured stones, our craftsmen work to the highest standards using traditional skills, and appropriate modern techniques. Each design is initially executed in the form of a master drawing, and from this our craftsmen create the final piece. Combining generations of experience and many years of skill and artistry, Alabaster and Wilson is an established leader in the field of fine jewellery. Please browse through our site and contact us for more information or to commission an exclusive design.